A classical approach separates the applications into two categories - "Thick Client" and "Thin Client". Thick client is a traditional discrete application which runs entirely within the user's PC. Thin client is usually represented by the internet browser connected to a web application which stores all information. The eWay-CRM technology uses Smart Client technology, which combines the pros of both above-mentioned solutions. User can use a fully-fledged graphic interface; the application can dynamically react to input from the user and use local resources. At the same time the application is easily upgradable and most importantly, the application ties in existing clients with whom the user is clearly acquainted - mostly through the MS Office application. The application runs within the host application (MS Outlook, MS Word, MS Excel, etc.) and is fully integrated to their user interface. The user is not exposed to a new, unknown interface, the current interface simply integrates the new functionality. The application utilizes local sources (processor, RAM), as well as the local periphery (phone, fingerprint reader, barcode reader, etc.). The application can also work easily with files stored on your hard disk. The application never runs alone and is always part of a bigger distributed solution. All data with which the application works come from the server. The application communicates with the server using the XML Web services technology. Because the application runs on the client's computer, it doesn't rely on constant connection to the server. If connection is not available, the user can continue to work with the application. After the restoration of connection, all data will be automatically synchronized with the server. .NET Framework technology allows automatic actualization of individual modules, while ensuring consistency across the application. The application checks for new updates and offers the user the opportunity to download the new version, or it can update automatically. This ensures that the user is always working with the latest version. 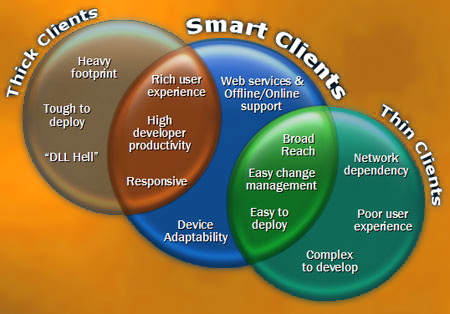 The client application in eWay-CRM is based on the Smart Client technology (described earlier). The eWay-CRM information system uses the Microsoft Outlook Add-in technology, and thanks to that, it is fully integrated with MS Outlook. This integration guarantee a high level of the User comfort. After the installation of eWay-CRM into MS Outlook two toolbars appear. The toolbars are the basic controlling elements of the application and thanks to them eWay-CRM is always at hand. Just one click the familiar interface and you are ready to work with your data from eWay-CRM. The client part of eWay-CRM information system also offers very good integration with other programs from the MS Office package via Microsoft Word and Excel Add-in. Because of this, it is possible to open documents from eWay-CRM directly into associated applications (MS Word, MS Excel, MS PowerPoint, etc.) and similarly it is possible to save documents created in MS Word or Excel directly into eWay-CRM without a need to save documents unnecessarily to your local hard disk. The eWay-CRM information system does not only consist of the client application integrated to MS Outlook, but also contains the server part. The server enables effective work with data from eWay-CRM with more clients in different locations. 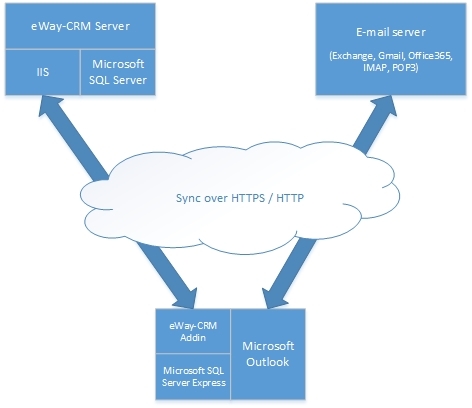 The server part of the eWay-CRM application comprises a data repository (mostly MS SQL Server databases) and a web service which allows communication between the data repository and particular clients. Communication is ensured via SOAP technologies (Simple Object Access Protocol) which use the HTTP or HTTPS protocol for sending messages in the XML format. Thanks to this solution, the maximum compatibility and transmittance in most web interfaces are guaranteed. An indispensable part of the eWay-CRM system is eWay Agent. eWay Agent runs in the background and automatically synchronizes local data with data on the server. This function ensures the accuracy of displayed data.